An unknown entity calling itself the “Labor Standards Compliance Office” is mass mailing deceptive letters to Washington businesses and nonprofits that appear to be bills from the government, but are in reality solicitations for labor posters that can be freely obtained, the Northwest Progressive Institute has learned. One of these suspicious-looking letters showed up this afternoon in our mail, and after reading the fine print, we called the Department of Labor & Industries and Attorney General Bob Ferguson’s office to ask if they were aware of the letter. Scores of businesses are contacting the Department of Labor & Industries to report they have received an official-looking letter that implies they must buy required workplace posters or face fines. L&I did not send the letters, but wants to remind companies that the workplace posters are available for free. The mass mailing has confused many business owners, who assume it’s from L&I. The letters say “final notice,” are addressed to individual businesses, and include a payment stub to purchase the posters for $295. It’s true that the state and federal governments require certain posters be placed at job sites. While private vendors may sell the posters, the government provides the posters at no cost. The free state-required posters are available from any L&I office or by calling 1-866-219-7321 or downloading from the L&I website. The letters do not include a telephone number, fax number, or email address, or the name of an actual person. The letters are, as the above news release mentions, addressed to individual businesses and nonprofits. 1201 Pacific Avenue is the address for Wells Fargo Plaza, one of the highrise commercial office buildings in downtown Tacoma. It is managed by Unico Properties. Commercial real estate firm Kidder Matthews, which sells office space in the building, calls it “Tacoma’s premier Class A office building”. A search by us of the Secretary of State’s Corporations Database for “Labor Standards Compliance Office” yielded nothing. A search of databases maintained by the Departments of Revenue and License also yielded nothing. It seems that the “Labor Standards Compliance Office” is doing business in Washington State without being properly licensed or registered. How ironic. It also appears that they mined publicly available business records for the purpose of sending this solicitation. The Secretary of State makes the entire Washington corporations database available in XML and text formats. Anyone can build a list from those records. State law requires that individuals requesting certain public records (like from the PDC or one of the state’s universities) certify that they will not use the records for commercial purposes. However, it isn’t clear to us whether the corporations database is similarly off-limits. There doesn’t seem to be a warning on the Secretary of State’s website. Attorney General Tom Horne is today warning Arizona consumers and small businesses to be wary of solicitations that appear to be an official notification from a government agency. There is currently an official looking mailer being sent out by the “Labor Standards Compliance Office” requesting a fee (generally $295) from consumers in return for providing up-to-date notices for businesses to post to comply with the State of Arizona and the Federal Government. This sender is not affiliated in any way with the government, but is instead a private non-governmental business. Small businesses are not required to purchase these posters and should be wary of the “FINAL NOTICE” and “DUE NOW” claims stated on the mailer. The Arizona Attorney General’s Office advises consumers to read all fine print, do research on companies that are listed on mailers, and be cautious about the authenticity of mailings that appear to be from a government agency. California’s Department of Industrial Relations released a similar warning back in September (PDF). It looks like the people behind this letter have been targeting businesses in multiple states west of the Rockies. We assume they are also operating the website located at laborstandardscomplianceoffice dot com, which advertises a phone number (1-888-755-3386) but no address. The domain is registered with NameCheap through the registrar eNom. This is not a bill. 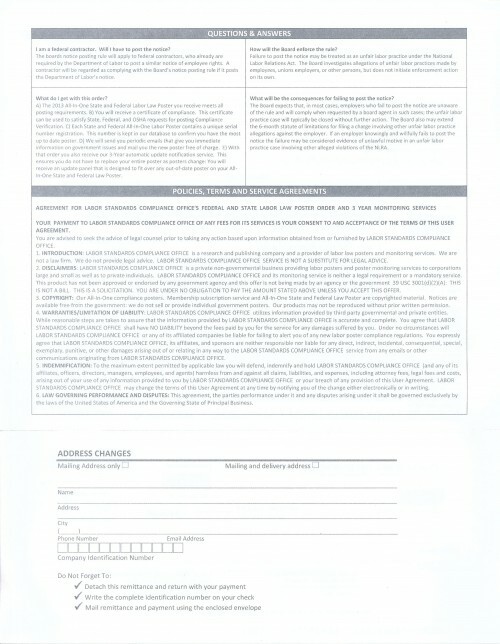 This is a solicitation you are under no obligation to pay the amount stated above unless you accept this offer. This product or service has not been approved or endorsed by any government agency and this offer is not being made by an agency of the government. The letter may not be a real bill, but it is cleverly designed to look like one. (Evidently, that’s why there are disclaimers on both the front and the back). The fine print is so small that even a person with good eyesight could not make it out without holding it at a very close distance. If you ask us, this letter is the snail mail equivalent of a phishing email. Phishing emails are messages that look like they come from a business or the government but were really sent by scammers. The emails urges recipients to follow a link and input passwords, contact information, or credit card account numbers into a form on a website the scammers control. Recipients are often told the agency or business that is being spoofed needs the information to safeguard them (which is a lie). A legitimate business does not attempt to sell products or services by pretending to be the authorities. This “offer” is a scam, and we wonder whether the promised service (which supposedly includes a “certificate of compliance” and a “serial number”) will even be provided to the people who send checks or money orders for $295 to the sixth floor of Wells Fargo Plaza in Tacoma. We assume somebody with premises there is operating a virtual office or mail forwarding business of some kind, which the people behind these letters are using. 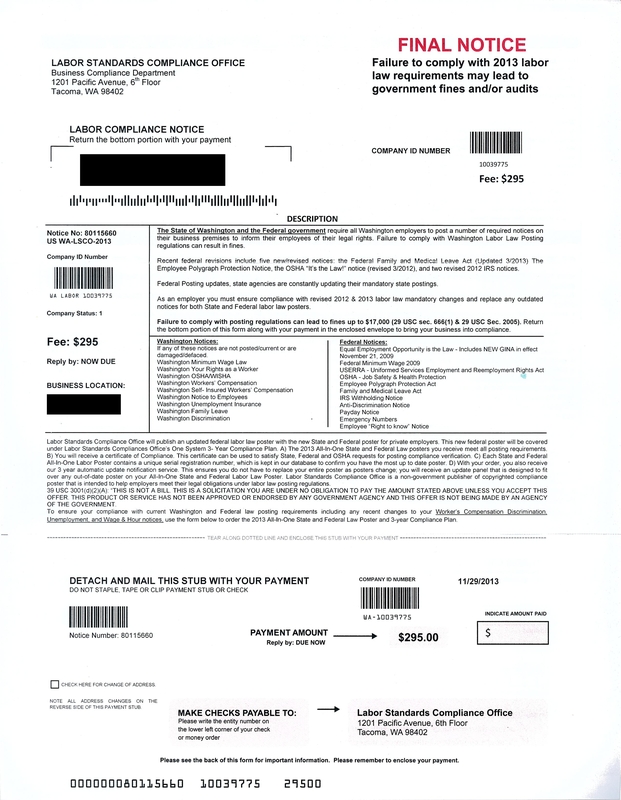 If you have received one of these letters and you remitted payment along with the stub to the “Labor Standards Compliance Office” believing that you were responding to a government notice, please file a consumer complaint with the Attorney General’s office immediately. Simply follow this link to the online form, or download this PDF and return it by mail. Provide your contact information and your story so that the Attorney General can investigate this scam and ascertain who might be behind it. I received one of these letters and I also received a phone call probably from the same people. It is a total scam and I think the sheriff needs to pay these guys a visit. What if you didn’t fall for it? Should I still fine a complaint with the AG? I received one of these “notices” yesterday and turned it over to my attorney. Man, it really looks real and I couldn’t figure out how in the world I should be paying $295 for a poster that I can get for free. I received one of these in the mail yesterday for a business I closed down in November of 2008, so whatever database they are using is not up-to-date! I just received one and thought I had missed something in reporting for the state. They need to do something about this. Compliance with labor laws is a huge deal and this solicitation is very misleading. Thank God I researched it before sending anything in thinking I was late for not complying sooner. We received this same letter. After being worried about a fine and a threatening possible tax audit, I continued to read this letter on the back. I was so angry by what we discovered. What a scam! The news channels should broadcast an immediate warning notifying business owners of this company’s activity. I got this letter the other day and found it especially suspicious because 1. There was no phone number, 2. I closed my business 2 years ago. I was just about to research it for a phone number to dispute the charge when I found this website. Something needs to be done about those letters. © 2019 The Northwest Progressive Institute. The Cascadia Advocate loaded in 0.221 seconds.